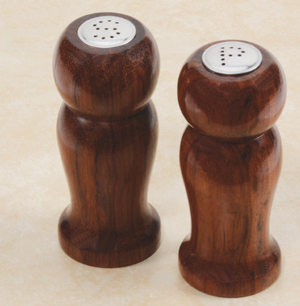 This set of Salt and Pepper Shakers is a great addition to our offering of Pepper Mills. The holes in the cap are patterned as S or P to designate salt or pepper. The kit includes 2 food safe 1" diameter tubes to hold the contents. Two end caps that press into the bottom of the tubes are included. The tubes are epoxied into the wood blanks and the project is then turned on the standard pen mandrel using the bushings offered below. 1-3/8" and 1" Forstner bits are needed to complete the project.